Last week the yoga class I take from time to time decided to meet on the water. My mornings tend to start in a not very expansive way, something I’m not proud of. My initial reflex when I open my eyes, in that first lucid moment between dreams and reality, is to do a mental scan of the things I know are in store, and brace myself for the things I don’t, yet. I wasn’t always this way. But experience has shown that by the end of the day there’s usually some unforeseen thing, some blindsider that makes me exhale and say, Whoa, didn’t see that coming. Sometimes I wake up wondering what’s going to be The Thing today. I don’t know if this is common among parents of large families. But I know this isn’t the most healthy way to greet the day. “There she is,” Erin called back from under the brim of a floppy pink straw hat, and reached back a muscular arm to hand me her binoculars. Not more than 50 yards away, an enormous swan sat on her nest, a camel-neck queen on a pedestal of sticks. Her mate drifted watchfully about 30 yards away. “Last year when I sat here once, the cygnets poked out and walked around,” Erin said. We floated there awhile letting our kayaks drift, then back-paddled away with quiet strokes. I have written that way before, fending off distractions by typing with my eyes closed (thank you, rigorous high school typing class). But that’s sitting still. Paddling blind I could ram into one of the other kayaks, into someone’s dock, the swan. I was never a big fan of pin the tail on the donkey, and I’ve woken abruptly from nightmares about driving a car unable to see. It’s tempting to invite in labels like “type A” or “control freak,” but let’s not. Let’s just acknowledge that most people tend to be more comfortable with all their senses and limbs in play. That’s the cornerstone of the control myth, isn’t it? This belief that if you can see it, touch it, hold it, you can fend off disaster. And its corollary, that if you can’t hold onto something with an iron grip, you’ll plummet. I faced this the hard way on a highwire outdoor adventure in December, and by hard way I don’t mean the mortal-danger way, but the tearful mortifying way. Memories of walking that line pop up at the most inconvenient times, usually when I’m clinging vice-like to something and afraid to let go. Control. I pointed the kayak toward the far shore, a small patch of town beach where my children sometimes swim, and closed my eyes. After less than a minute I became aware of the sound of power tools, possibly too close, and the buzzing of an insect, definitely too close. I cracked my eyes feeling like a kid touching her security blanket. Of course I was only a few feet from where I’d been before, well in the middle of the pond. The insect was either gone, or never there in the first place. The tools were way ashore. I closed my eyes and started again. 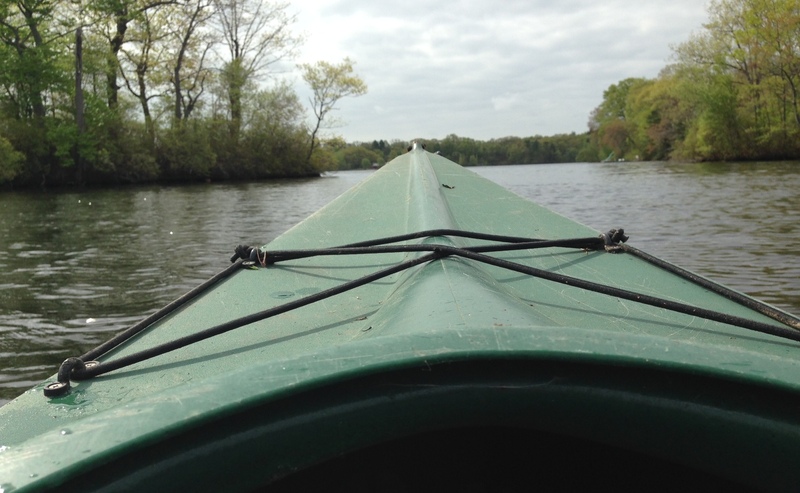 Slower, more conscious paddling made me better able to hear which sounds were close and which were further away. I held the paddle loosely and kept my path flexible, listening to the drone of construction and the quieter sounds under them: the other kayakers receding, the birds, my own breathing. I went on for about ten minutes until Erin called us back, and I didn’t peek again. It didn’t feel that there was anything up ahead that I needed to see. What I didn’t know then was that the day would end with my six-year-old breaking his arm on the backyard swingset, a displacement of two bones that would land us all in the ER for hours — except for my 13-year-old, warming up for the school concert we were now going to miss. Over the course of four hours we had vending-machine popcorn for dinner and made silly iPhone videos, waiting on a gurney between xrays and possible surgery, trying to fenagle the 13yo a ride home from his concert. By the time everyone was back home in bed, surgery scheduled, it seemed impossible that the tranquil kayaking had taken place that same calendar day. But in the scope of things, the drama was like an ordinary high tide. Up, down, no permanent damage done. The 6yo wasn’t in much pain, and would be fine after readjustment and a cast; the three others with us would live without finished homework and a proper meal, and the 13yo learned that sometimes you have to play to empty seats where your family is supposed to be. I used to wish I had a crystal ball to help me be better prepared for whatever the day was going to kick up. But knowing the day would hold the ER visit certainly wouldn’t have made my kayaking hour as pleasant, and I doubt the not-knowing made me any less able to handle it on the fly. Ditto the car trouble a few days later that would leave me stranded on the highway shoulder at 10pm after a book event. Things happen. You deal with them as best you can. And usually, the tide recedes with little or no harm. In my novel The Unfinished Work of Elizabeth D. (http://www NULL.indiebound NULL.org/book/9780307887825), I wrote about the arbitrariness of life, how you can either be paralyzed by the fear of being blindsided or accept the not-knowing, because what’s the alternative? It’s easier said (or written) than done, but it still rings true. I’m not advocating life with blinders on. But. While it might be true that what you don’t know can hurt you, sometimes knowing isn’t so helpful, either. If I’d known how difficult it would be to write a novel, would I have done it anyway? Would we have children, any of us, if we could be given sneak peek of our most difficult day? Marriage? Here’s one more cliché with more than a glimmer of truth: A little knowledge is a dangerous thing. It might just be safer, or at least saner, to paddle blind into each uncertain day. Keeping a loose grip, staying quiet enough to hear what’s happening around you, and being flexible enough to adjust on the fly. This entry was posted in On Faith, Hope & Love, On Parenting, Wild Kingdom and tagged kayak, kayaking, paddling blind, yoga. Bookmark the permalink.